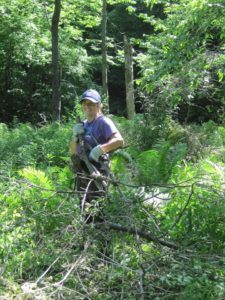 Volunteers in the upper watershed have been busy this summer with an invasive plant removal project. The effort is made possible through a Massachusetts state funded Wildlife Habitat Management Grant and is underway on the Old Mill Trail (along the East Branch of the Housatonic River in Hinsdale and Dalton Massachusetts). The removal focused on invasive shrubs, primarily Asian Honeysuckle and common buckthorn.